Europe's most powerful leaders gather in Sofia for an EU summit. They've been discussing the Balkan States' possible EU membership as well as what to do about Donald Trump. It follows the US President's recent decision to pull out of the Iran nuclear deal. Trump has also threatened to implement tariffs for imported steel and alumnium on the basis of 'national security'. "Looking at the latest decisions of President Trump, someone could even think 'with friends like that who needs enemies?" Tusk also insisted the EU must stick together and not be bullied by the US into concessions. Global leaders will further discuss its US relations on Thursday. "This was a very deliberated move. Donald Tusk treats this as a very personal matter. He grew up wanting to be part of the West. So this current gap in between the US and Europe he feels that very very personnally. What he wanted last night was to get leaders to really talk about Trump at the dinner of this Summit. Which was what they did, it wasn't a discussion about Digital Innovation as planned, it was about keeping united on Iran, it was about sticking to the line of retaliatory measures when it comes to Trump steel tariffs. And they did that. So Donald Tusk achieved all that he wanted yesterday." 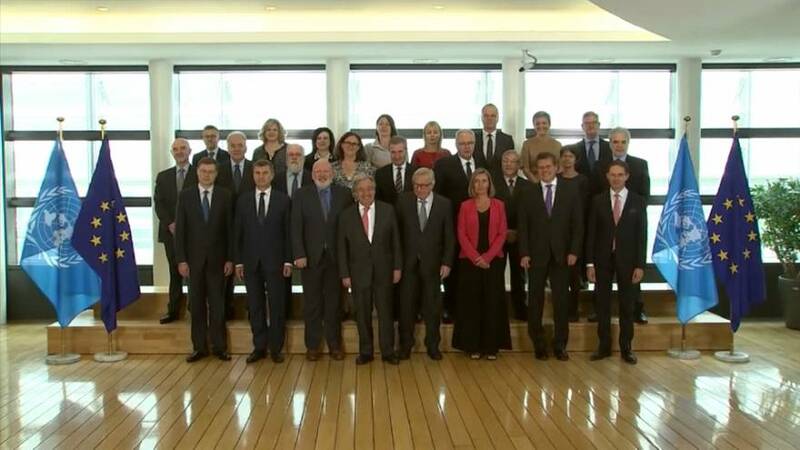 As Europe's leaders demonstrated their unity with a family photo, they'll be after close co-operation on a crucial day of talks in Sofia.